Brick with brick dental work on facade. Original owner Boston and Maine RR. Themes - Architectural, Commerce, Community Development and Industry. 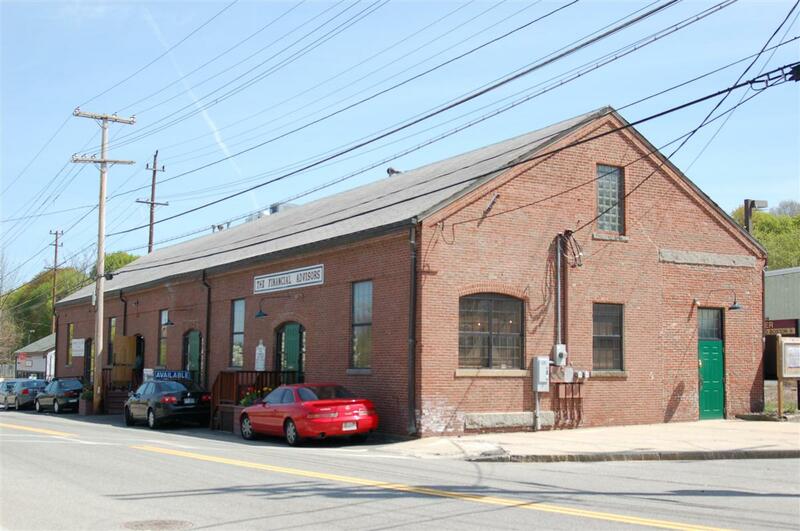 This structure was built by the Boston & Maine Railroad as an Freight shed and weighing station. A spur line went though the building to allow rail cars to be unloaded under cover then pushed trough the north end to be reconnected. On the west end of the building can be seen the outline of the original car door opening with the granite lentil on the top. 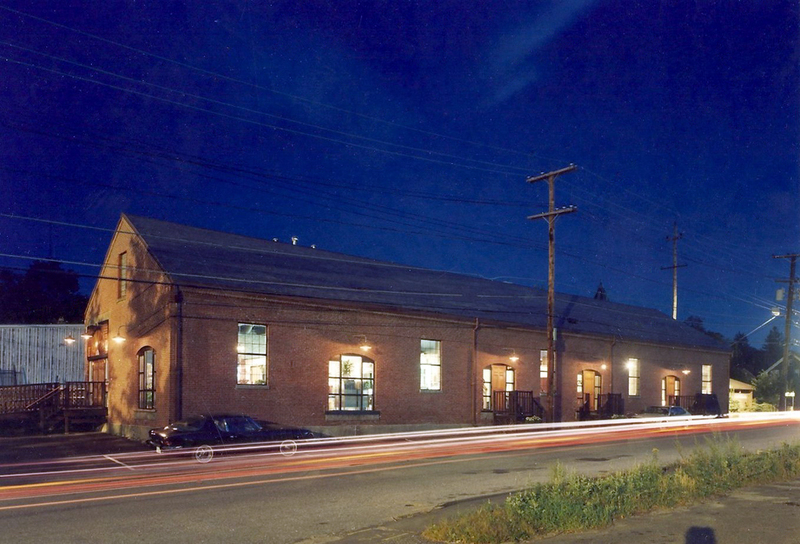 The building is 35 feet wide but 120 feet long to accommodate the rail cars. The floor platform inside the building was built at the height of the rail car deck so merchandise could be rolled off. A large floor scale, Fairbanks #103 with a 6 ton capacity was located inside to allowed for agents to price goods shipped by rail. This is the reason that all the current business entrances require stairs. A second granite threshold on the west end suggests that at one time a second doorway was located here to unload goods into wagons and trucks. A floor plan of the building dated April 21, 1916 shows a small storage room at this location. Printing shop, 1937 Vermont Reality Co. - M.J. Peresky and A.J. 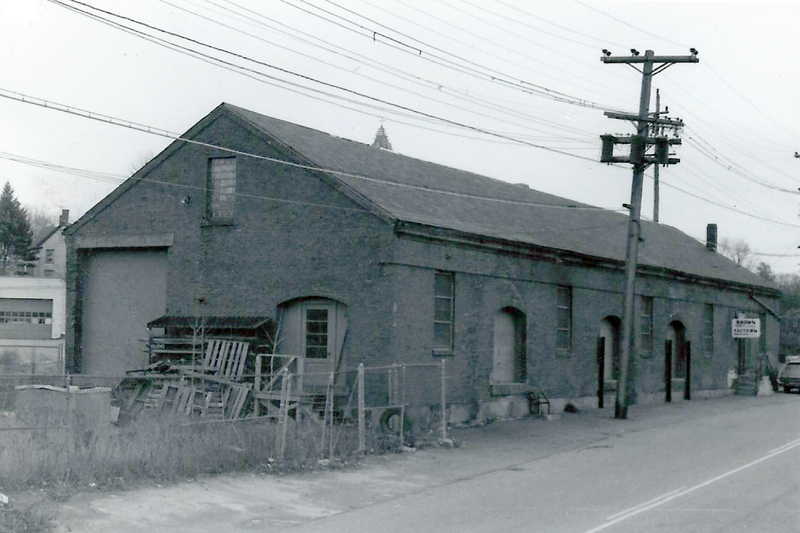 Berenson "Brick Warehouse" . 1966-1986 Brown ownership - 1980 sign Brown - Eastern on south end. Vacant in 1977. See also Area Form A Survey - Abbot Village, Railroad Avenue. Plan of Land Showing Smith and Dove #5 Mill - April 26, 1937 (see area form bibliography). Major Alterations Altered considerably after 1912; interior and exterior rehabilitation in 1990s - windows and entries.